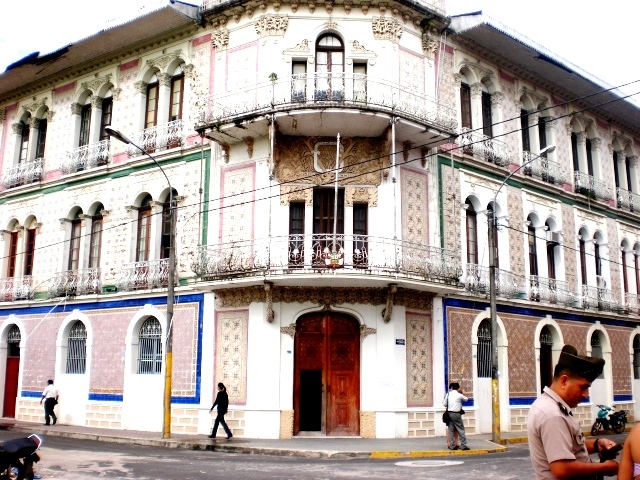 French style building in the heart of Iquitos, a Peruvian Amazonian town that is accessible by boat or plane only. It was the fall of 2011. We were four brown divas bounded together on a raft made of local wood. We hired some local hands to help us set up our new boat ride. We faced our fears in taking off on a three-day journey down the Amazon. We were not the outdoorsy type. Most of us hadn’t even camped out at night before. We spent our first full day in an exchange of laughs, sprinkled with some annoyances. Our strength was tested physically, but mostly mentally. We saw little fish dipping and diving over the gentle waves. We even spotted a pink dolphin that was coming up for a elegant jump and splash. We saw the local teams fly past us as if we were in an old station wagon, and they had built and mastered riding the waves with their Mercedes raft. We sang old school hop hop in the rain, as we gently paddled off , slowly and steadily, in the direction of the others. Nightfall hit, and we made it just in time to the first base. We slept on the floor, on thin mattresses, where spiders were tucked away in the wall crevices, where no amount of mosquito spray was protecting against the bites, where the measly meal left us still famished, but we were too physically and mentally exhausted to complain. Some of us had enough energy to muster up a chat by the picnic tables set up near the water. The rest of us passed out into a deep sleep that was rudely interrupted by the following day’s wake up call. We had less energy and enthusiasm on day 2, but we forged through, booted up and off we went. The novelty and excitement of day one had peeled off and we emerged as a different group. Still dedicated, but now it was about enjoying the journey. We took in the natural beauty that completely enveloped us. We endured another tough day on the Amazon. Our discussions a bit more subdued, our energy now expended on physically focused on moving through the waters and arriving at the day two campsite. Then the grey clouds hovered. More and more, the blue sky turned from a light to dark shade of gray. We thought we were just around the corner, so we persevered with a bit more OOMPH. Boom, a flash of lightning. The thunder clapped much later, so we knew it wasn’t too close, but it could come closer. As a team we needed to make a decision - do we pull over (on the side of the banks of the Amazon) and wait until the storm passes? Or do we continue on? We pushed our way to the river backside. That when we realized one of the Brown team girls couldn’t swim. I dived in to pull the raft closer to the edge. The rest of us slowly made our way to land. After one person peeing themselves, one person vomiting, and another in desperate prayer mode, we continued on in silence. We stuck together and eased each others nerves. Should we continue on into the forest? Should we wait here? Can we flash our light? Will we be found? Will an animal eat us? Will we live the Brown team rendition of Tom Hanks in the Cast Away? Then we saw it. A burst of light. It was a rescue boat, that was making so much noise. It's blaring light cutting through the darkness. We jumped up and down, flaying our arms, screaming, “WE ARE HERE, OVER HERE, COME!!! VEN, AQUI ESTAMOS.” We were saved! Nada. No nos vio, para nada. Our shouts were drowned out by the loud boat motor and they didn’t see us. We became unsettled, what if they don’t see us. How long will we last here? What if there are really man-eating animals, monsters that lurk on the edges of the Amazon river bank, that would eat us? Small talk. Banter. Brainstorming a plan. Then, the boat passed again. This time we flashed the light of our Nokio phone torch (side note this was not a smart phone). It worked. The boat shifted and turned toward us. We had completely abandoned our raft. We collected the rest of our belongings and made our way to campsite, day 2, but arriving on the rescue boat. We stayed at a “hotel” which was basically a very humble home that locals offered out to us. At least we could sleep on a bed, and shower in an upgraded setting from the “campsite”. The next day, we slapped on some lipstick, we did a Brown team huddle, and we marched ourselves onto the big boat, which we rode to the finish line. We are accompanied by some of our friends, as well as a few misplaced expats working in the black market in the Amazon, who shared stories of hustle and blow. We literally enjoyed the journey and realized, don’t be prescriptive, you’ll get to the finish line, eventually, it may not be how you thought you would arrive, but you will get there. Change up the routine and strap in the kids for a fun ride through the souks of Marrakech and homey stay at a Riad. Follow along our adventure to the Rose City. Last year we work together with a refugee center in Athens and created a creative empowerment workshop. If you are looking to see our process and what we observed, read along our briefing. Share what you would do differently. How do you prepare for workshops with a similar topic and composition of participants? What has worked and what hasn’t? Once upon a time a group of four girls formulated a Brown team and raced down the Amazon where they learned, in the best sense, the meaning of enjoying the journey, the process, the ups and downs, instead of transfixing on the finish line.